9:00am - Stall holders arrive... Somebody will be there to meet and greet you, and explain what you need to do. To make your life easy, make sure you load your table in last, so when you arrive at our event, its the 1st thing to come out of the car. 10:00am - Once all the stall holders are all set up, we let the customers in ! 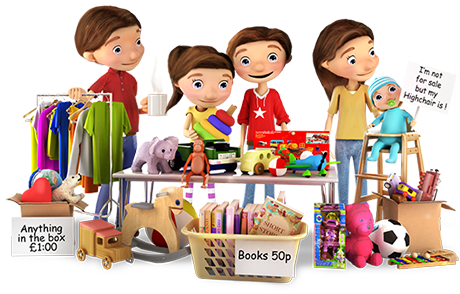 11:00am - We have a Swap Shop Session for the children. 12:00noon - Barnardo's arrive at the end of our event and anything you have not managed to sell, if you want to, you can leave it behind at their donation point... Saves you having to take it home ! 1. Please enter your booking details below and make your payment via PayPal. 3. Also an email from PayPal confirming your payment. 4. If you can’t find your booking confirmation email please check your junk folder. 5. If you do not complete your payment via PayPal, then your booking is not complete. 6. Please print out your confirmation email and bring it with you on the day as proof of payment. PLEASE NOTE : Sadly bookings are NOT transferable or refundable. Some information that might help ! * these fields are mandatory and need to be filled in to process your booking. Make sure you bring a table and load it in your car last, so it’s the 1st thing out of the car when you arrive. Your pitch will be big enough to display 1 car load of items only. Trying to cram more than 1 car load onto a pitch only effects the families pitch next to you. Over loading your pitch, will reduce your selling potential, as customers will not be able to see your items easily. For Health & Safety reasons, it’s very important we keep the walk ways clear. If you want to do our event with a friend, please book 2 pitches, as we can always put you together... Just let us know when you book ! Might be good to bring a float and carrier bags to give away. Your pitch will be big enough for 1 table, so you can display things on it. You will also have a small amount of space either side to perhaps display a clothes rail, or a pram. You can also display a line of items on the floor in front of your table.